Maintaining servers falls into two phases: First, bang head until server works; second, capture effort into some automation tool like Puppet or Chef. Recently, I’ve been playing around with making the first phase closer to the second. For lack of a better word, I’m calling it literate devops. I’ve talked about using org-mode’s literate programming model to investigate new ideas and crystallize thoughts, and this approach appears to work well for me, since I lack those esoteric sysadmin skills. Which appends some lovely host-connection magic. Goody. Now comes the literate devops. Since I always have Emacs hosting with my current sprint’s notes, so instead of opening up a terminal to the virtual machine, I instead created a new header in my org-mode file, and started entering the commands in the file. What good is this? Well, it allows me to log, document and execute each command. Clicking the hyperlink gives me the online details I discovered, and I can enter prose about each command, and I can execute the commands from within Emacs. Yes. 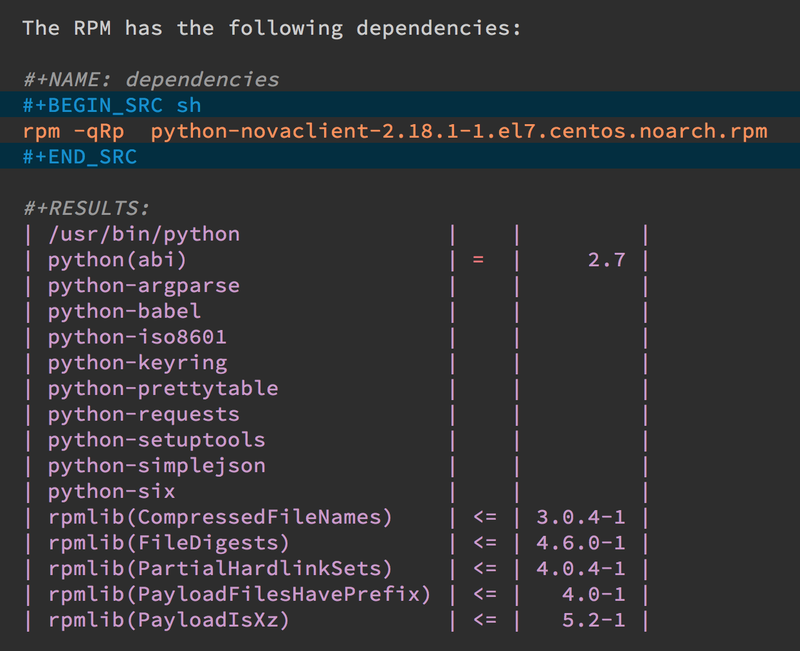 I can execute the commands from within Emacs. Hitting C-c C-c (Control-C twice) runs the code based on the language, and in this case, it runs it within my shell. The results are placed back into the buffer or written to a file, and more. What about the Virtual Machine? The first code block is some Emacs Lisp code that changes the default command for executing sh code, and the second block I run to see if it connects correctly. Now, I can continue learning how to accomplish my target, all the while documenting and validating my steps. The end result can be exported to web or wiki page. Yes, some executing some commands can be quite time-consuming and verbose, but often I need to search the results, and having the results in an Emacs buffer allows me better searching. Can you Use the Output? The results of some commands are often needed for the next command, and I’m sure you love using your mouse to copy and paste part of the output that you want to use. Notice that I named this source block. Also notice how Emacs automatically broke the results up into a table. 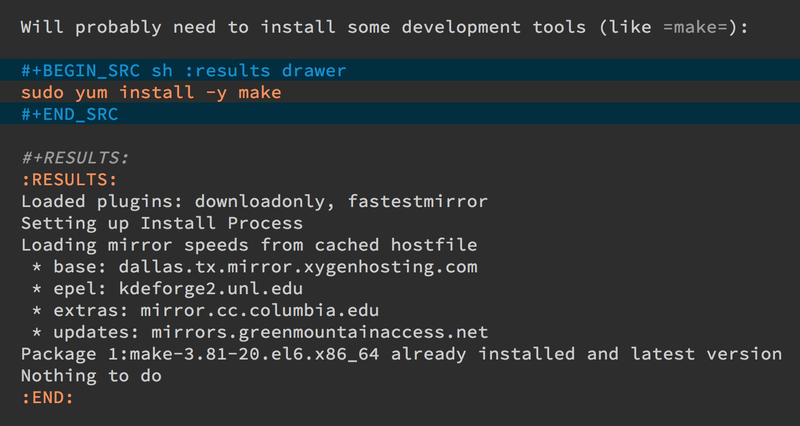 By default, the output from shell commands are split along newlines and spaces…which is quite useful for me. For here is another source block that creates a variable named DEPENDS that uses rows 2 through 10 of the first column as an array. 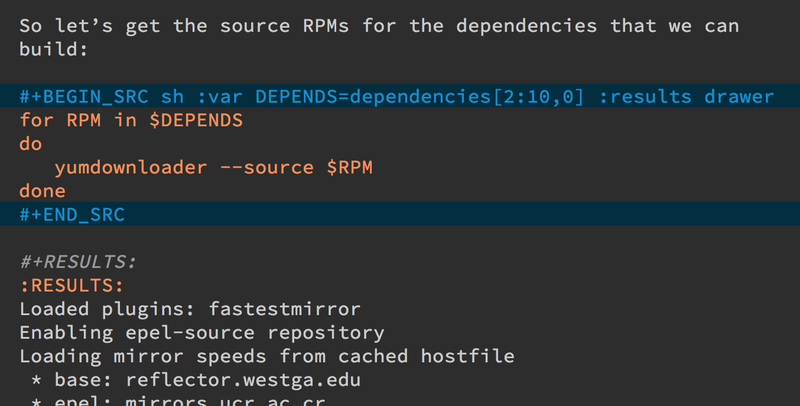 I can then download the RPMs I want without any mouse interaction. No, this shouldn’t replace real DevOps automation, but this seems like a good way to take notes before you sit down to write that cookbook.